Venerable Mount Takao, located just an hour by train from downtown Tokyo, has long been known as a quick escape from the concrete jungle. 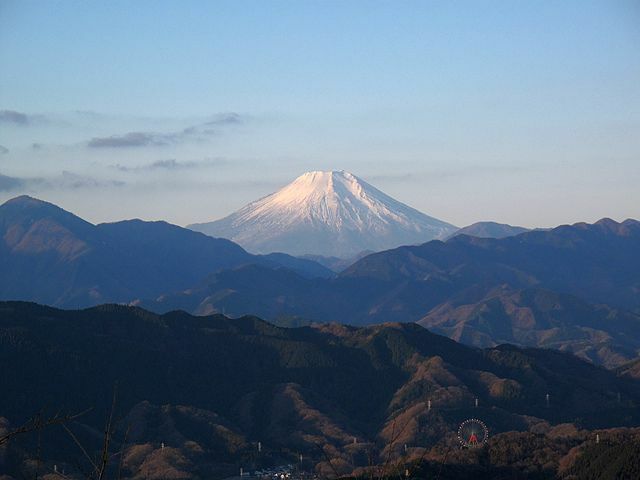 Easy access plus spectacular views of surrounding mountains, including Fuji-san, has always made Takao a popular destination. 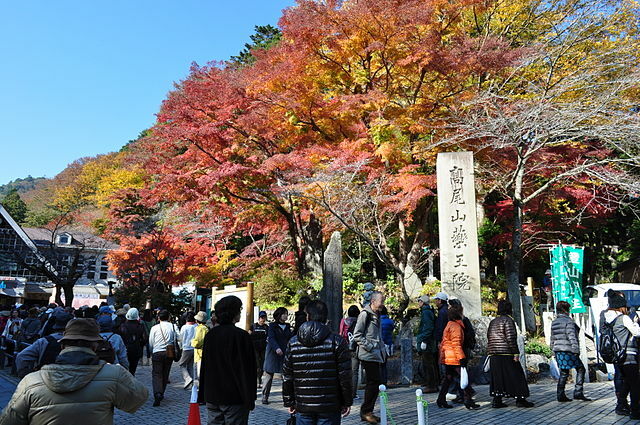 ​Mount Takao is a mountain in the city of Hachioji, on the far western edge of the Tokyo Metropolitan District. Standing 599 meters tall, Mt Takao has been regarded as a sacred mountain for over a thousand years. ​These days it’s both a religious destination and a popular hiking spot with more than 2.5 million annual visitors. 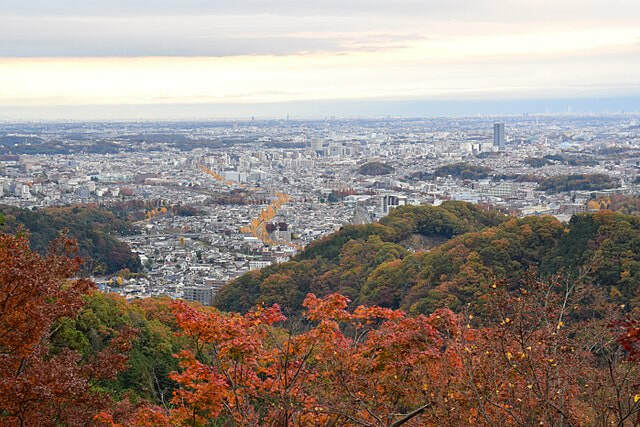 ​​Mount Takao makes a beautiful day-trip year round, but there is no better time to make the peak's acquaintance than in autumn, when the changing leaves paint the trails in the crisp yellows, reds and oranges of fall. Takaosan can get very crowded on weekends and during the month of November. 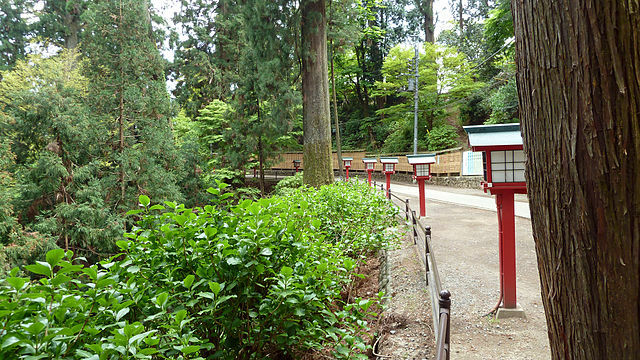 Mount Takao features 8 Hiking Trails, most of which are paved and an easy trek even in sneakers. The trails are well groomed and well sign posted, including signs of the flora and fauna to watch for along the way. Trail 1 is the main route, a straight shot up to the peak that takes you past the mountain's main attractions: An Observation Deck doubling as a Beer Garden during the summer months, an active Buddhist Temple Complex and a Monkey Park. ​The entire path is paved, although there are steep stairs in places. 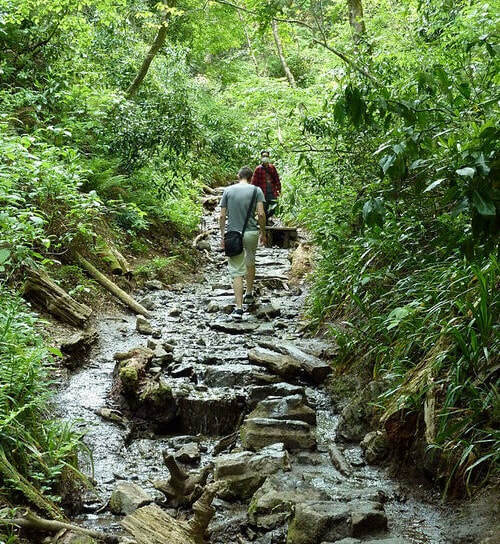 The truly dedicated usually tackle Trail 6 or the Inariyama Course, a beautiful forest hike that follows, and at some points enters a creek snaking down the side of the mountain. Other lesser traveled routes are also available that may take longer but are more scenic. ​Mount Takao is an excellent place for wild landscapes with a wide variety of plants "1,600 species" and insects "6,000 species". For those who prefer a little assist or are in a hurry, a chair lift and cable car are available to take visitors up to the halfway to avoid the steepest part of the trail. This is a good option if you are bringing along small children or the elderly. 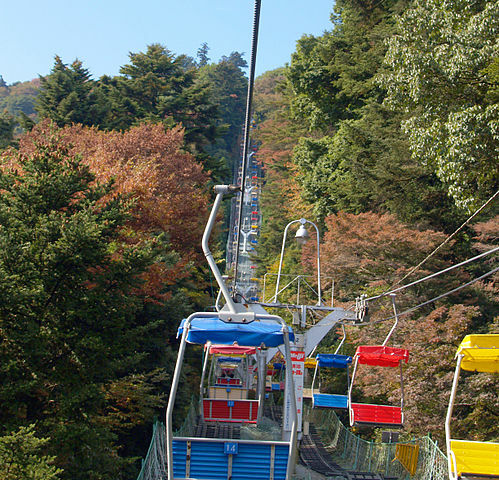 ​The system nominally has four stations; two each for the chair lift and the cable car. However, the distance between the pairs of stations is only a few dozen meters at the base of the mountain, and approximately 150 meters at the top of the services. Trail 1 leads past the top stations on the way to the summit. ​Just above the cable car station is "Beer Mount", a restaurant/beer garden with an expansive outdoor seating area and a particularly fine view. During the summer months, the beer garden stays open until 9 p.m. and has an all-you-can-eat-and-drink buffet. Near the cable car station, there are also shops selling food and souvenirs. The monkey park sits together with a botanical garden featuring native plants of the area and is worth a little time if you want to imagine yourself a naturalist. Just beyond the monkey park is a 450-year-old cedar tree known as the "Octopus Cedar" because of the way its roots about grown around the rocks. This is only the first of several massive cedar trees you pass as you proceed along the trail to Yakuo-in. Shortly after the octopus cedar, the trail splits. The left-hand trail is steeper with lots of stairs; the right-hand trail is a longer but more gradual ascent. They both lead to the same place. 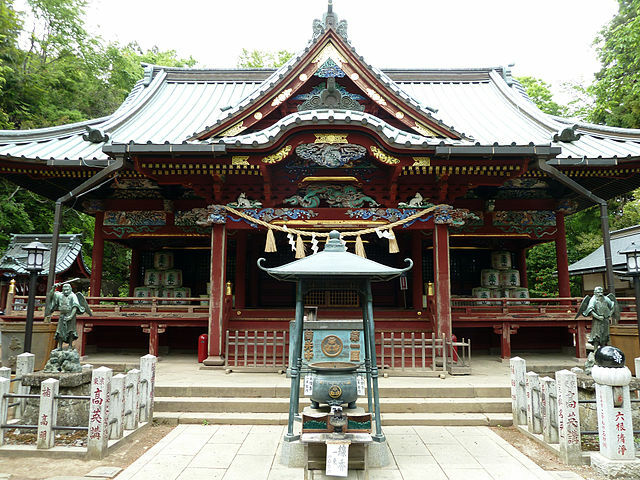 Yakuo-in founded in the 8th century, is dedicated to Yakushi Nyorai, the Buddha of medicine and healing. It is a large complex of several temples and their guardian shrines, and is always busy with worshipers undertaking various activities to secure good health and long life. At the top of the mountain there is a visitor center, restaurant, and viewing platform where Mount Fuji is visible on a clear day. Actually the summit is famed for its unparalleled views of distant Mount Fuji. Not to mention the handy arrays of vending machines to either help you rehydrate "Soft Drinks" or dehydrate "Beer" after the long hike up. You can go back down the way you came, or on another of the trails. Trail 4 is particular fun for the return to the cable car and chair lift stations, as it takes you across a suspension bridge. Or, if you’re feeling energetic, from the peak continue on an 18 kilometer adventure to Mount Jimba. The Tokai Nature Trail is a long distance walkway that traverses 11 prefectures and covers 1,697 kilometers. One end of the Tokai Nature Trail is at Mount Takao, at the Takaosan-guchi Station, and the other end is at Minoo, near Osaka. ​Take the Keio Line Express Train from Shinjuku Station to Takaosan-guchi Station "takes about 50 minutes". 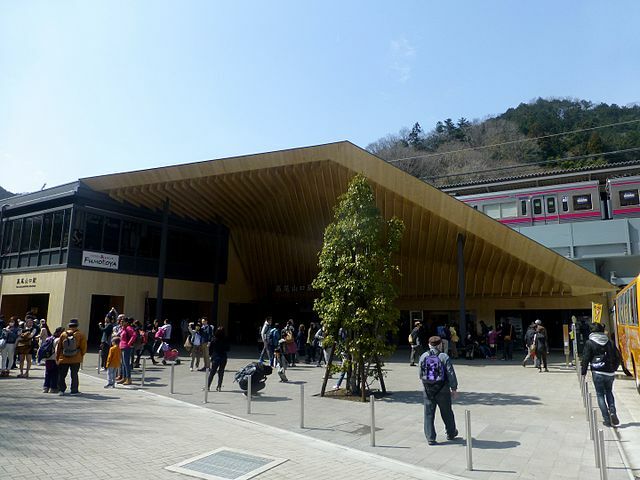 ​Takaosan-guchi Station, the train's terminal station, is located at the foot of the mountain. From station, it’s only about a 5 minutes’ walk to the cable car, the chair lift and the trail heads.